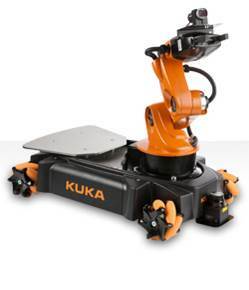 Seattle/Augsburg, June 2015 – The International Conference on Robotics and Automation (ICRA) at the end of May revealed how to control the KUKA youBot research robot using open source software and provide information on the uses of the LBR iiwa lightweight robot in typical research applications. This year, the world’s largest robotics conference washeld in Seattle, Washington. At KUKA’s exhibit at the ICRA, visitors have been explicitly encouraged to touch the KUKA Leichtbauroboters LBR iiwa. In addition to providing the possibility of guiding the robot by hand, the focus of the demonstrations has been on programming the “connectivity interface”. 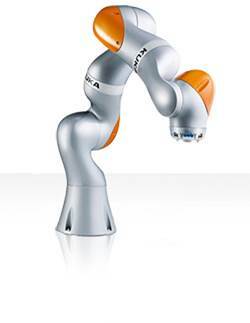 “With this open interfaces KUKA enables access to several levels of control. With this we combine the best out of two worlds: Availability and reproducibility from the industrial point of view and creativity and innovation from the exploratory point of view”, explains Dr. Günter Schreiber, Product Owner Connectivity in the Research and Development Department of KUKA Robotics. The goal is to provide visitors with an understanding of the ways in which the LBR iiwa can be used in typical research applications. “The LBR iiwa has already established itself at various research institutes as a shared hardware platform and – thanks to its new controller – as a Software pattform as well. We would very much like to build on this potential in order to enable even closer research cooperation,” says Rainer Bischoff, Head of KUKA Group Corporate Research. The KUKA youBot also provides researchers and their successors with the hardware basis for the successful development of algorithms. It can be used as an experimental platform for safely trying out new things and for transferring findings to other applications. Rather than using a proprietary controller, the KUKA youBot is controlled using open source software. It is also equipped with a powerful PC board, an EtherCAT-based interface to the electronic drive system and many other open interfaces for sensor connection. A report on research findings as well as KUKA youBot and LBR iiwa applications in the field of mobile manipulation for the factory of the future will be provided during the “Mobile Manipulators for Manufacturing Applications” workshop on May 26. Open source software will also be the topic of a workshop at the conference on Saturday, May 30. The session will be entitled “Shared Framework for Medical Robotics Research”. Dr. Cyrill von Tiesenhausen, Business Development Manager at KUKA Roboter GmbH, will focus on the LBR iiwa during his presentation and use benchmarks and international research projects to demonstrate that the KUKA lightweight robot is the reference platform for research in the field of manipulation as well as human-robot collaboration (HRC). As in previous years, KUKA will also be sponsoring the KUKA Service Robotics Best Paper Award this year. Numerous applications are sent in by international research groups for the prize, which is awarded annually. The best publications will be selected by a jury and presented by the research groups at the conference. The winner will be announced at the ICRA and receive a prize of USD 1,000.